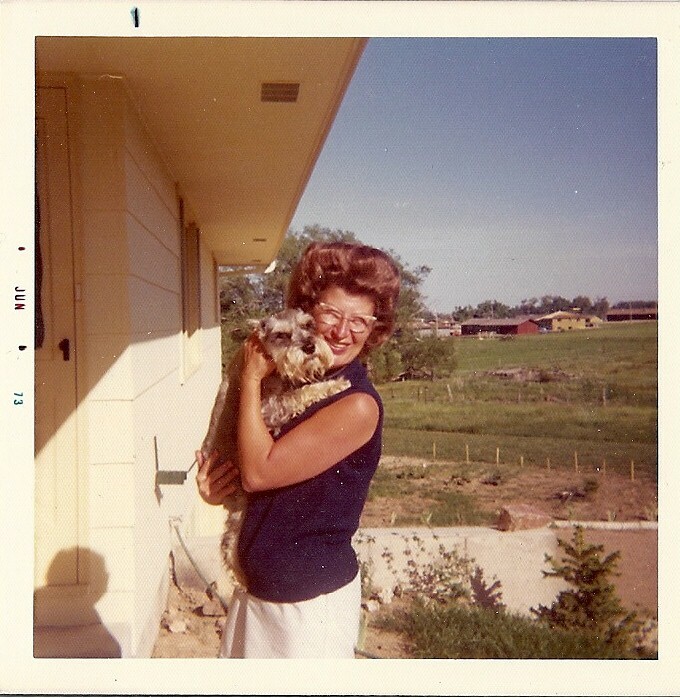 Update (10/16/12) – I have at long last had a chance to upload vintage pictures of my Grandma. I have had them for about 3 months, but due to crazy schedules and lack of energy, my boyfriend and I have only recently had a chance to scan and upload them. 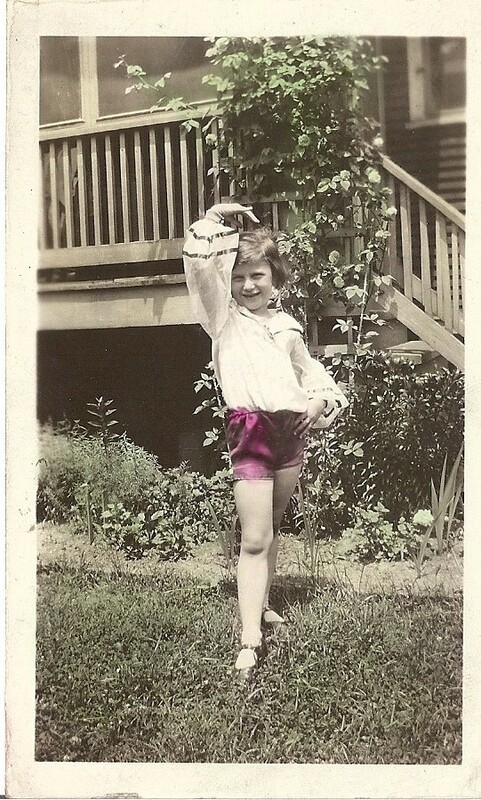 The name of this site is a reference to my late grandmother, Florence. While my aims with the site are more thoroughly outlined in my About section, it is only fitting to have a page dedicated to her and her life. I wanted to fill this page with photos of her: they do not completely align with the accompanying text, but I wanted a wide range of photos in order to share a wider range of her life. 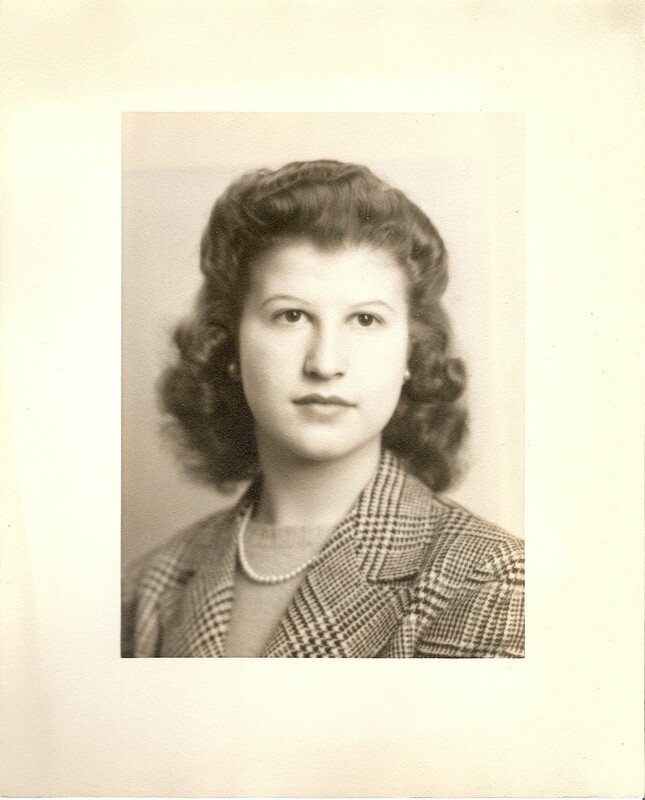 My Grandma was an extraordinarily kind, generous, and upbeat person. It is particularly extraordinary considering the hand that life dealt her, which I would argue was pretty crappy (from my understanding, her father definitely never would have been nominated for Father of the Year, and her husband– my Grandpa– wasn’t a thrilling character either). However, she never felt sorry for herself or left life get her down. She would have said that she made the best of what was given to her. I largely attribute her optimism to how healthy she was able to stay for the vast majority of her life. She was born on June 4, 1924 and grew up in Chicago. After she married my Grandpa, Ray, she had my Dad in 1950 and my Aunt in 1952. She and my Grandpa moved out to Colorado in the 70’s, where she took full advantage to all of this state has to offer and spent a lot of time outdoors. Until a few years ago, she was even part of a hiking group. Pretty good for an octogenarian! Until the last year of her life, she was always doing something: volunteering at a local performance theatre or the town’s Welcome Center, walking everywhere and rarely ever using her car, knitting baby booties while she watched college basketball. I think she only ever stayed still when she slept. There wasn’t a person who knew her who wasn’t touched by her goodness and philanthropy. She was unfailingly supportive of everyone in the family: after my Aunt had a motorcycle accident that left her paralyzed, my Grandma arranged all kinds of fundraisers to help pay the hospital bills (and during later hospital stays, she would stay by my Aunt’s bedside and knit scarves that she would later donate); she displayed a large print of my Dad’s CD cover prominently on her living room wall; she helped me make my Halloween costume– a princess gown– when I was 13. She was always very encouraging of my hobbies in art, crafts, and music while I was growing up. Many of the things that I made her were displayed all throughout her apartment. In August 2011, she had her first heart attack. The doctors told her that such an attack would have ordinarily killed any other 87-year-old. I saw her shortly after this, and she was not discouraged at all by what happened, though she seemed a little weak. However, she did not like that she had to take lots of pills. A month later, she had a blackout while she was walking in the park and hit her head on the sidewalk, knocking out several teeth and ending up back in the hospital with a brain hemorrhage. It was then that she began showing signs of brain damage. She slowly became more prone to falling, blackouts, and her memory began to deteriorate. She could no longer knit after a while. By February 2012, hospice caregivers stayed with her 24/7. This was very hard for her, since she had been so independent for so long; because her balance was so bad, the caregivers could not let her do anything for herself. 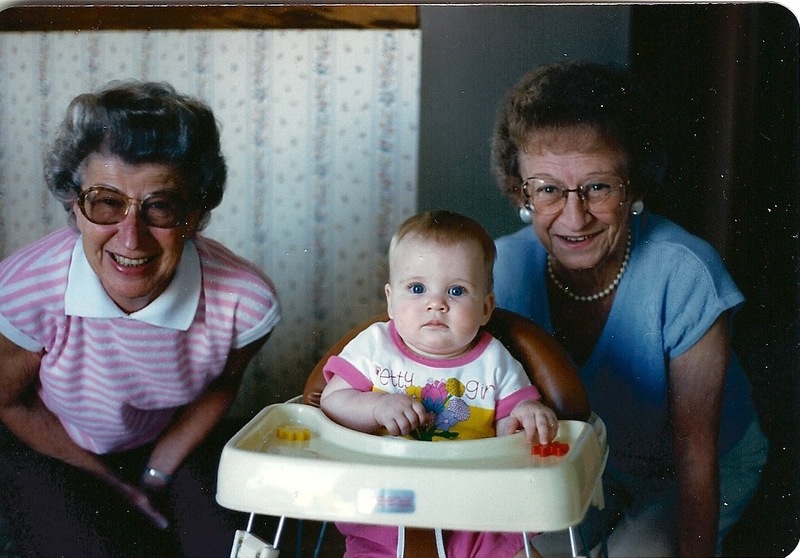 My Grandma, me, and her sister, Lorraine in 1987. She died peacefully on the morning of April 8, 2012– Easter Sunday. She was the first person I can say that I knew well who has died. My mom’s mother, Laura, died in 1998 when I was 11 years old; I am sorry to say that I did not know her as well as Florence. I like to think that both of them are in a better place now, and I am glad they are not suffering anymore. I know Florence was very unhappy towards the end– it is hard for me to picture her unhappy. There will never be another person like my Grandma. I want to remember her as she was before she got sick. I want to live as she lived: constantly thinking of others and with no regrets. The least I can do for now is continue making things for others in need, just as she did in life. I want to invite everyone to share their own stories in the Comments. They can be about grandmas, mothers, aunts– any woman (or man, for that matter!) in your family who left a indelible mark on your life. 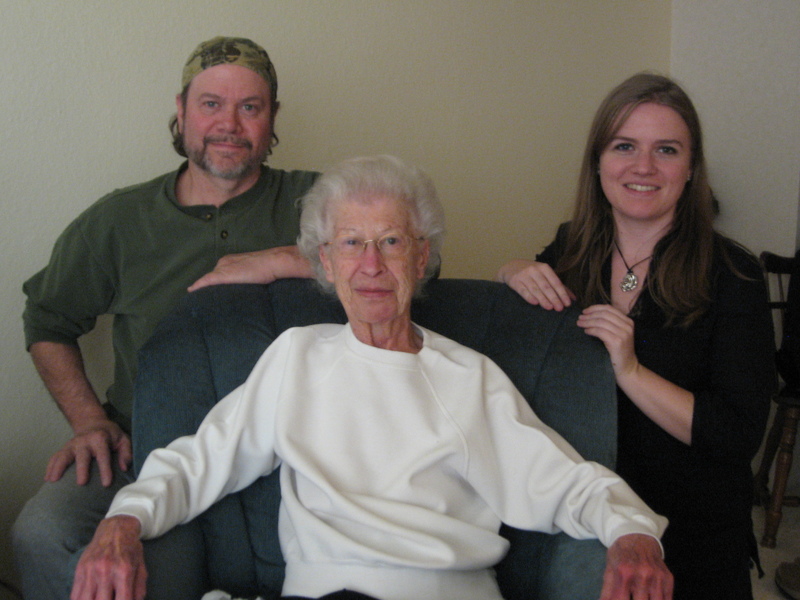 The last picture of my Dad, Grandma, and me, taken Thanksgiving 2011.